Failure gets a bad rap. We've been conditioned to see failure as negative, something to avoid at all costs. But failure can be one of the greatest gifts we give ourselves. You can either allow failure to pull you backwards, or you can choose to leverage it to propel you forward. But so many of us have been convinced otherwise. And now failure has become something we fear. But when we fear failure, we don't try unless we're guaranteed success. And that very act (or non-act) can be one of the biggest disservices we do to ourselves. It prevents us from trying something new or taking a risk. And when we never try, then we'll never know and always wonder, what if? So go for it! Go big, in fact. Because who cares if you fail? Failure can be one of the greatest catalysts for growth. However the choice is yours. You can learn from failing and it will make you better. Or you don't learn at all, and it will make you bitter. But I would caution you that if you've failed and didn't learn from it, you've failed twice. Builds resiliency: Life will go on. You're still here. So get up and try again. Only this time, you're a little bit stronger for it. Creates humility: No one is perfect. We all makes mistakes. And there is certainly no room for pride in our lives. When we see someone accomplish something great, we need to know that it's possible for us to do great things too. And if we think the other person is perfect, then we will give up before trying. Whether you like it or not, humility is good for both you and the people who are watching you. Causes change: When you fail, you have to do something different. The solution is out there. You've only learned that you haven't found it yet. 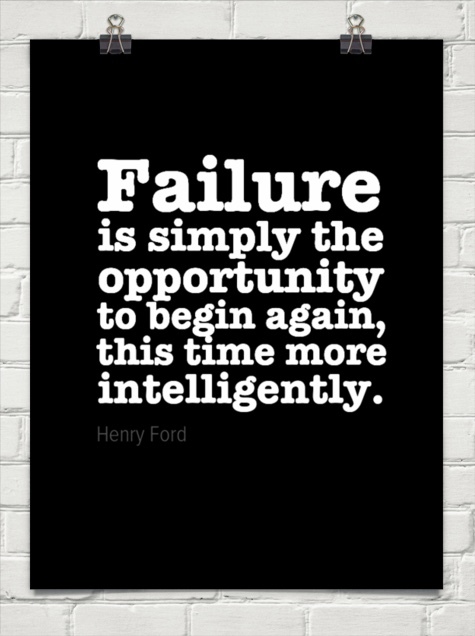 Henry Ford said it best, "Failure is not final. It is the opportunity to begin again, this time more intelligently". In other words, you are not failing, you are succeeding in finding out what doesn't work. And that is never failing. So what do you have to lose?